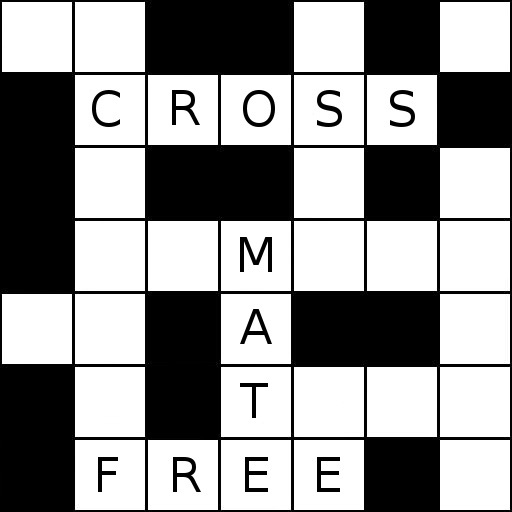 CrossMate Free is the best free crossword solver for many reasons. 1) Contains 55,000+ Proper Nouns, including full names, professions, nationality, date of birth and death for about 40,000 famous people and around 14,000 places, i.e. countries, cities, rivers, mountains etc. 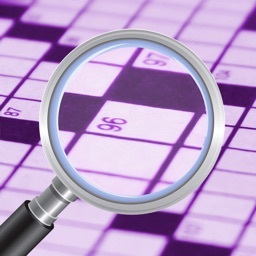 These proper nouns are essential for solving general knowledge clues, which can make up to 20-25% of crossword clues. These clues are the type that you either know them or you don't, i.e. difficult to just guess, so if you do not know a particular person you are usually stuck. 2) Provides filtering to narrow down on possible matches, essential when only one or a few letters are known. E.g. you can filter out rarely used words. Who has the time or patience to look through a list of 200+ matches? 3) Contains special functionality for solving cryptic clues and extensive help on how it use it. 4) Solves two word combinations and anagrams, particularly useful combined with first and last names of famous people, or when doing cryptic clues. 5) Each match informs you what it is, e.g. 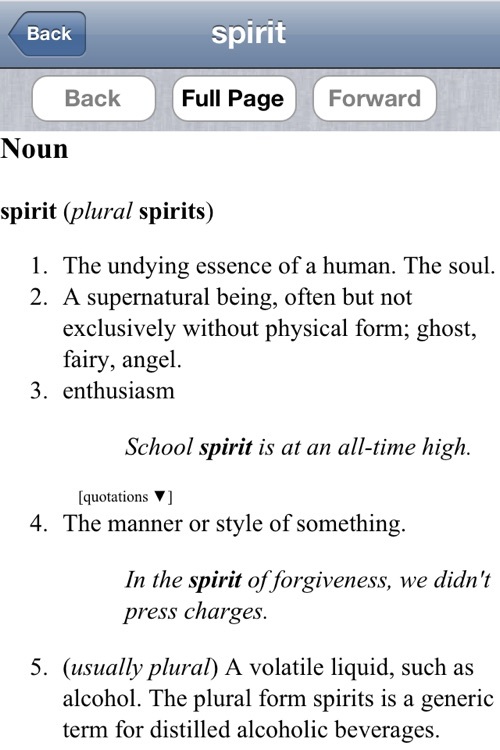 person, city, rare word etc. 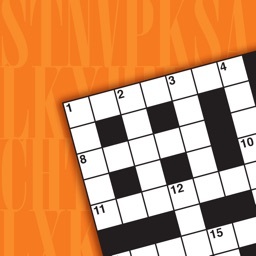 Most of these features are not in any of the other crossword solver applications. And they are all available without the need for a constant internet connection. It is the perfect companion whilst sat on the train doing the crossword in the newspaper. The free version contains all the functionality of the main version, but contains small adverts at the bottom of the screen. 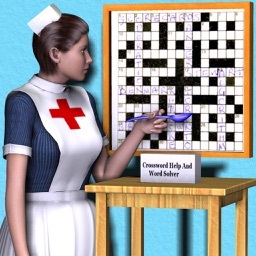 CrossMate Free is the ultimate companion for anyone that enjoys doing crosswords and other word games. 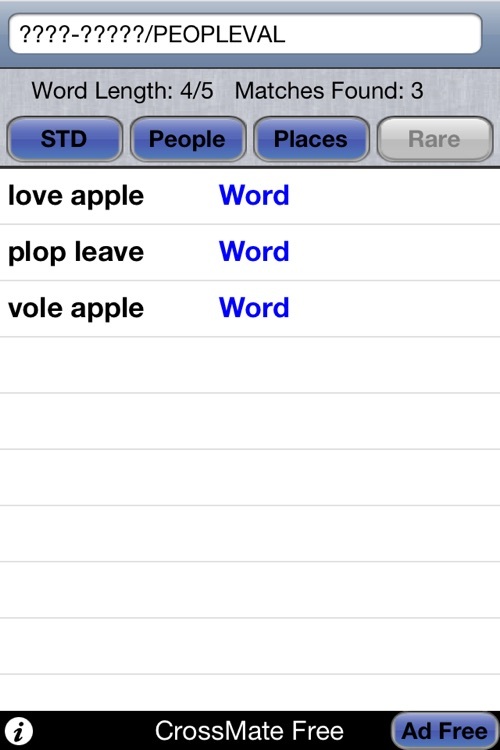 It can even be used to help with other word type games, such as Scrabble, Codewords or "Words with Friends". 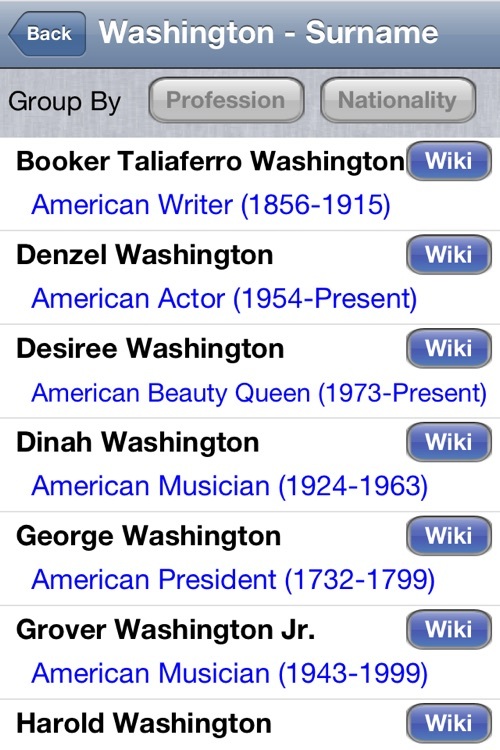 - Lightning fast search engine. No search button needed as possible matches are displayed instantly as you type. 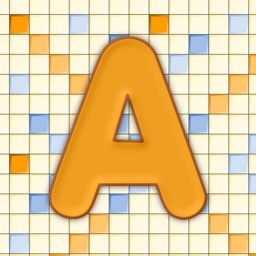 - Easy to use, just provide the known letters, hitting space for the unknown ones. - Comprehensive list of 300,000+ normal words, split into common and rare lists to help you find the right match. 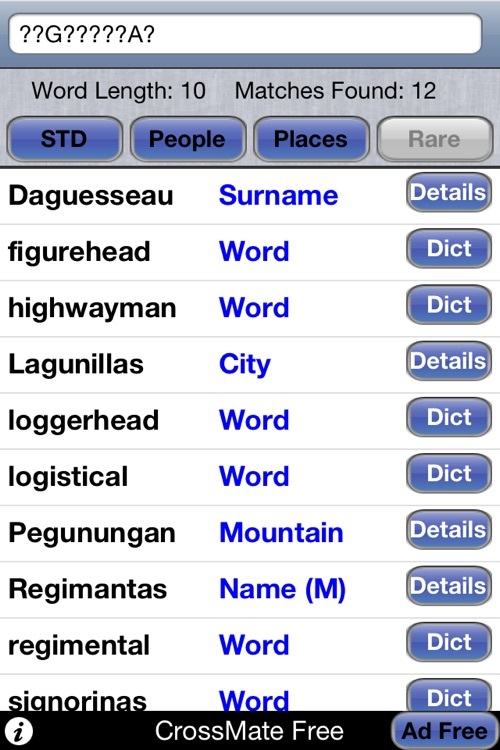 - An additional list of 55,000+ Proper Nouns, i.e. names of countries, cities etc, plus first names and surnames of famous people (both living and dead), as well as Deities and Heroes from Greek, Norse, Roman, and Egyptian Mythology. Details for people include nationalities, professions, and year of birth/death. - Finds Anagrams of the supplied letters, including two-word anagrams. - Easy to use filters to select the word list (or lists) to be searched, to help reduce the number of possible matches that must be looked through. - Supports double-word solutions, particularly useful in cryptic crosswords, when some of the letters can be guessed but it is not known in which word, and when searching for both names of people. Upgrade to the Ad Free version of CrossMate for a nominal fee.